In June, we visited my brother, Tom, his daughter, Rebecca and her family (husband Dominic, daughters Emma – 4 1/2 and Marla – 2 1/2). The first day we spent at Rebecca’s in Malsch. 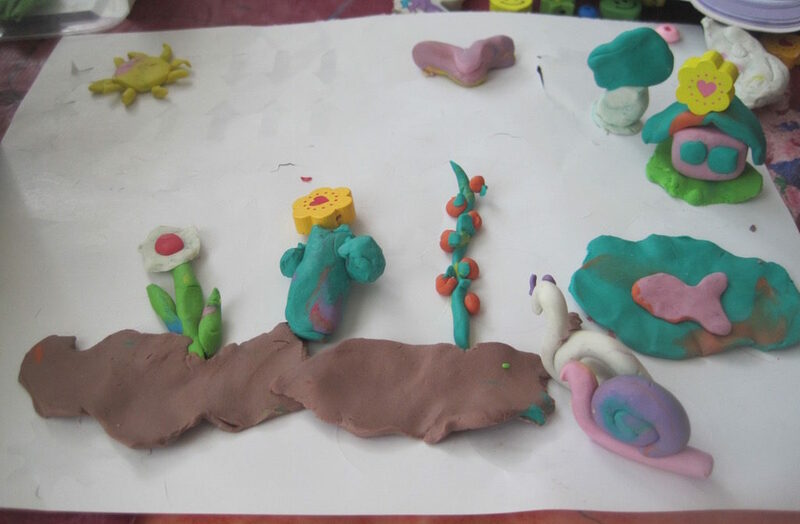 We made up for the language differences with the little girls with a variety of activities, including making a clay picture. See the snails in the lower right-hand corner and stay tuned! Art project with Emma and Marla. Rebecca made a delicious angel food cake covered in vanilla pastry cream with handpicked strawberries. The strawberries were deep red, sweet, juicy and full of flavor. As usual, we had this in the afternoon before dinner. This seems to be a tradition, because we had ice cream on Saturday before dinner. Dominic made a mixed grill of wursts, pork belly and chicken and we had a variety of salads for dinner. It was a great day and a great reintroduction to the little ones after 22 months! The next two days we spent at Tom’s. He has a spectacular yard, great for picnicking and he and I love to cook together. We especially like to cook some of the favorite things from our childhood. Macaroni salad was a staple of our family’s summer eating. We had it at home for dinner or lunch, or for picnics at the lake or at the various parks where we went hiking. Over the years, Mom became a bit of a “health trend” follower and the mayo went to light mayo or some other concoction. Regular macaroni became whole-wheat pasta. It just wasn’t the same. But Tom and I make it the traditional way. We also made potato salad and three-bean salad, also family favorites. Potato salad, macaroni salad and three-bean salad. He picked me up at 9:15 am on a Saturday and we shopped at the Real, a large grocery, variety store (they sell everything like a Costco or Sam’s Club with no fee). The meat, fish, cheese, cold cuts and produce were amazing. We got sausages, steaks and pork spareribs for the weekend, because stores aren’t open on Sundays we stocked up and bought all the fixings for our favorite three salads. We made a quick stop at a local farmer’s market that sells vegetables, fruit and plantings for your garden. Look how beautiful these “party” tomatoes are. I love that they call cherry tomatoes party tomatoes! 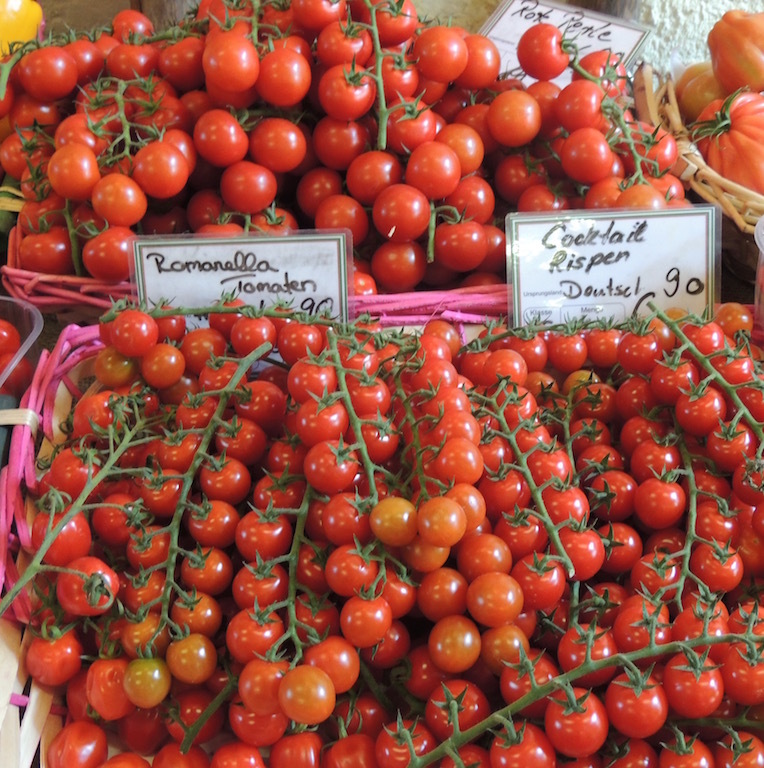 A small Karlsruhe farmers market – party tomatoes! 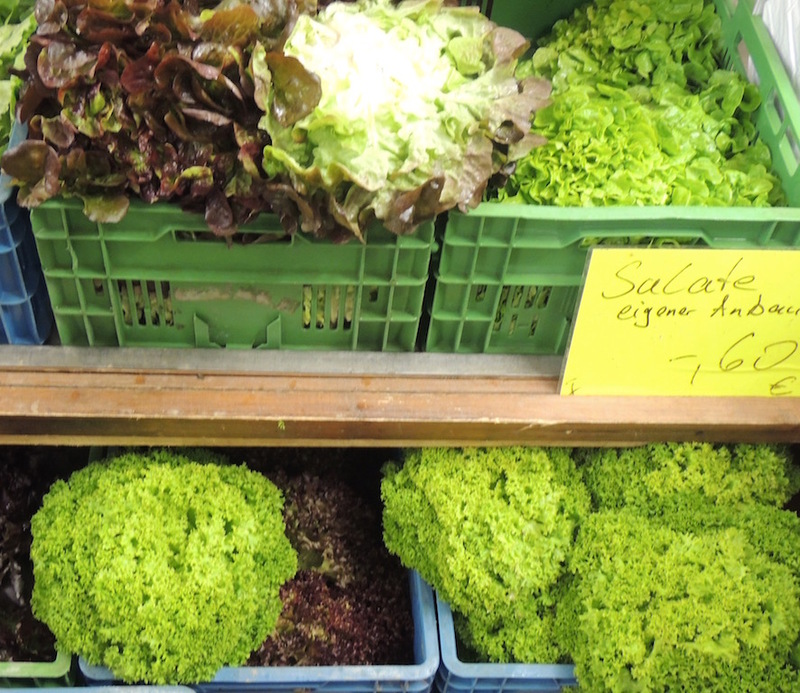 A small Karlsruhe farmers market – very tender salad lettuce. 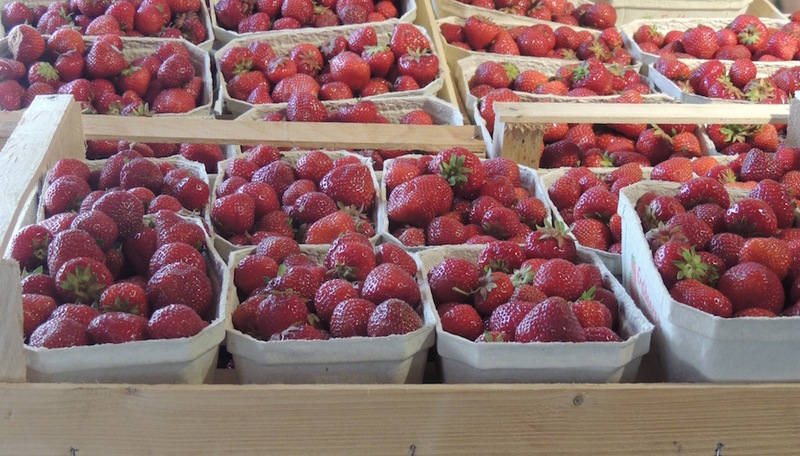 A small Karlsruhe farmers market – fragrant strawberries. We spent the morning cooking and then he left to get my girls, who chose to sleep in, and a few last minute items. 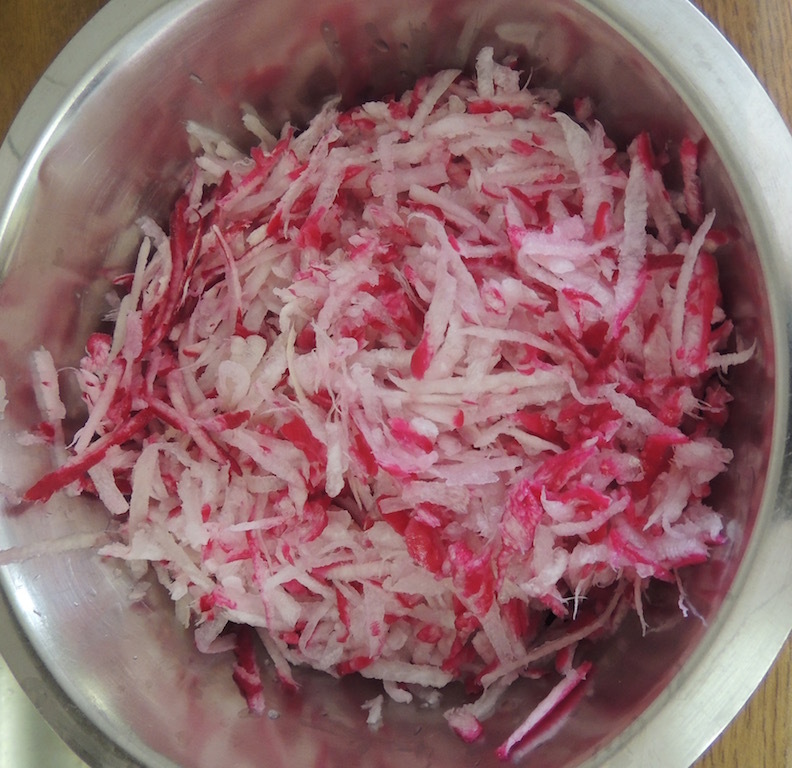 In the meantime, I grated these carrot-like radishes that he uses to make a raw tuna appetizer. I like to place the tuna on a cucumber slice, dab a little soy sauce over, add some horseradish sauce and top it off with the shaved radish. Delicious! 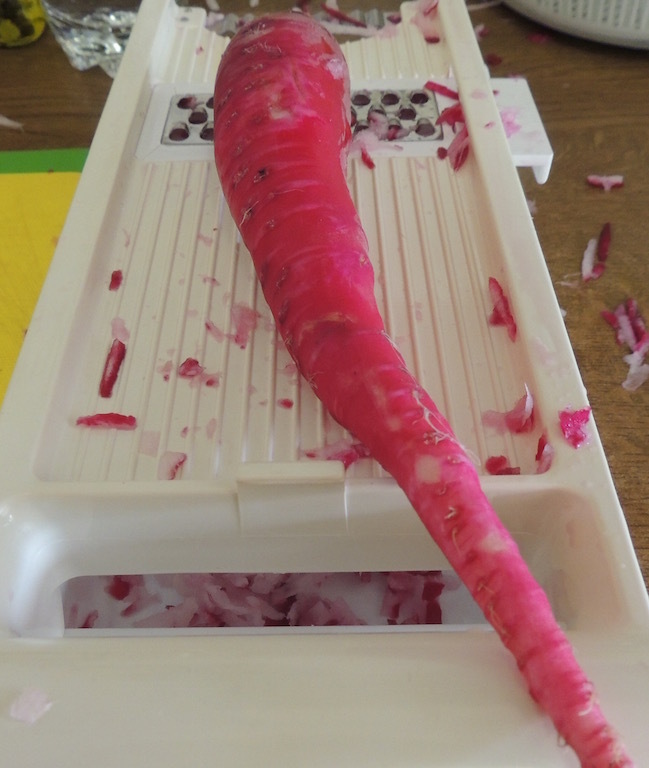 Radish – never saw one like this before; it’s quite spicy. The weather cooperated nicely on Saturday and Sunday and we were able to sit in his yard, barbecue, and hang out all afternoon. 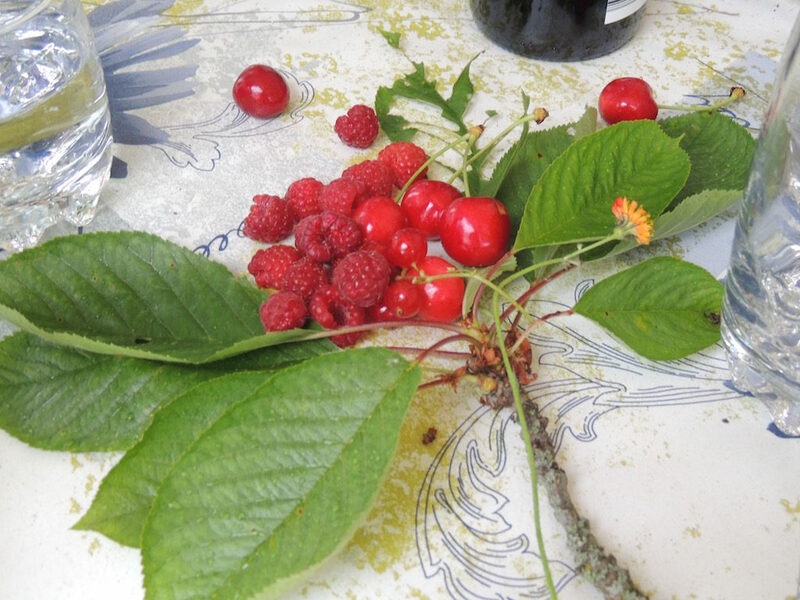 The cherries and raspberries are in season and we picked and ate them throughout the day. Fresh picked raspberries and cherries. 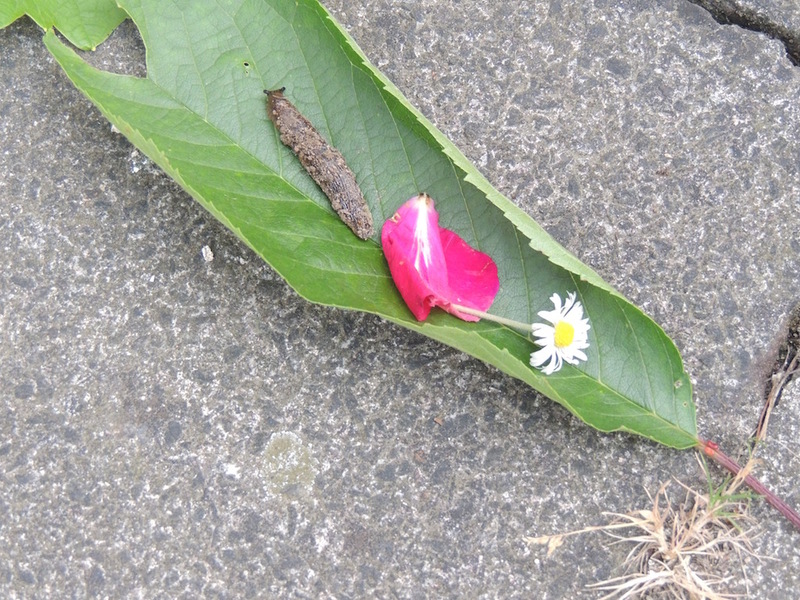 The little ones entertained us by searching the garden for schnecke (snails or more like slugs in this case). 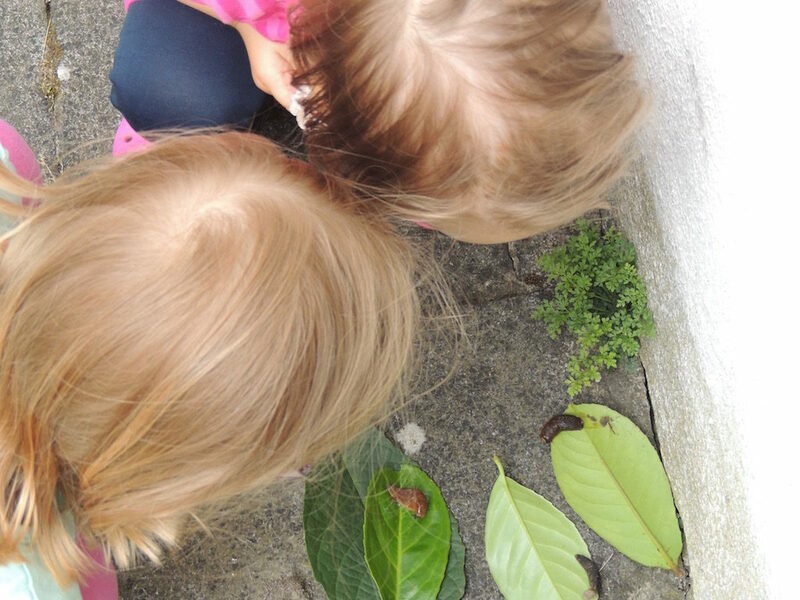 They became enamored with snails on their recent vacation to Mallorca. I much preferred their gifts of flowers and fruit to the schnecke! Marla apparently felt that the schencke could use some beautifying and I couldn’t agree more! We also managed to get in a couple of visits to the Der Vogel, the artisan brewery that’s attached to our hotel. They make an unfiltered Pils that I really like and the specialty beer was Hefeweizen. Tom picked up large take-out bottles for both days to quench our thirst and wash down all his delicious food. 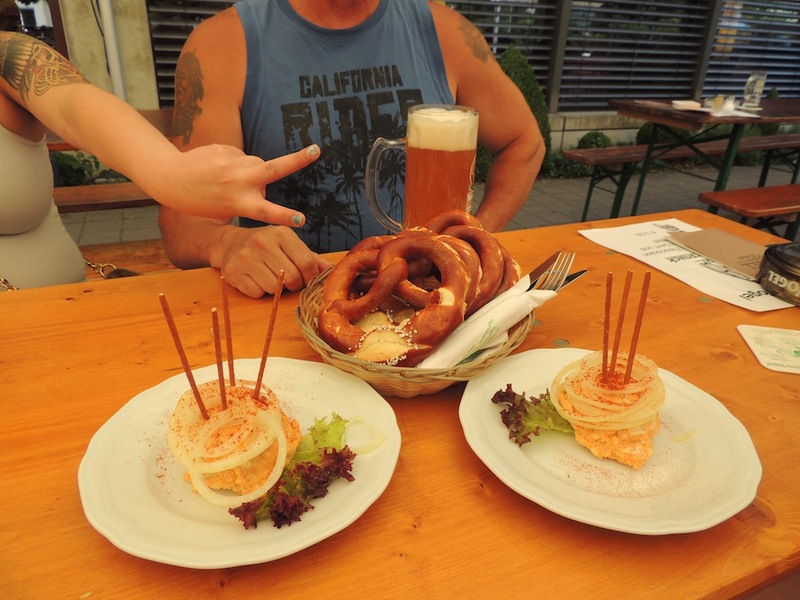 We also made it a point one day to have obadtza, a Bavarian cheese spread made of brie and butter, topped with onion rings and a sprinkle of paprika. We like to spread it on those big fat salted pretzels. It’s outrageously delicious and something I’m glad I don’t have easy access to. On Saturday night, on the way back to the hotel, we stopped off at Bistro Kiwi This is owned by Stefan, a friend of my brother. Stefan is a generous host and in addition to the beers we ordered, he comped us a couple of “Jackie’s neat” (Jack Daniels) and shared with us one of his homemade pepperoni wursts. It was delicious and he had Tom take the rest home for later. We definitely had more on Sunday. It was a very special and generous treat. 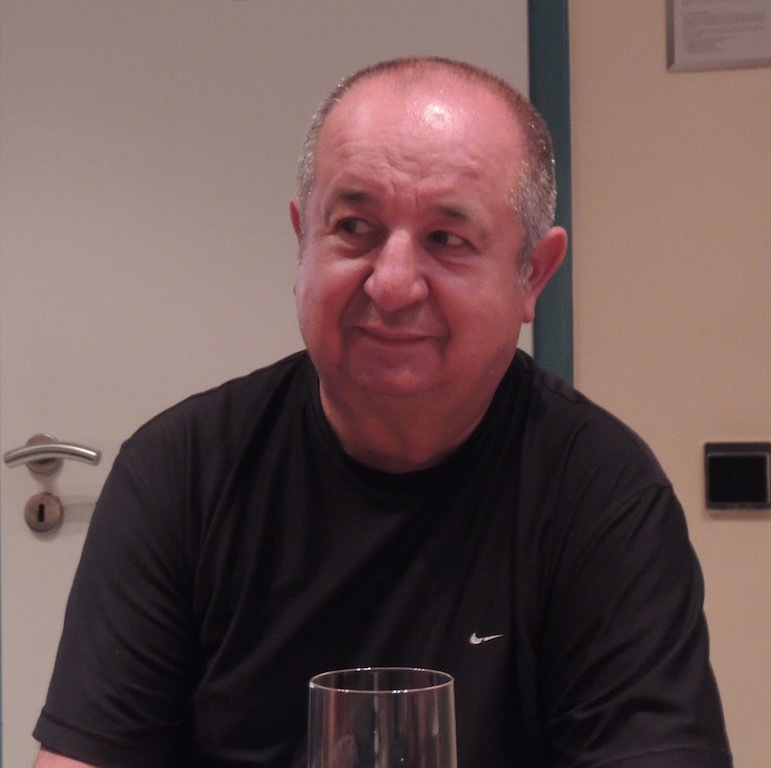 Thank you Stefan! As always, the trip comes to an end too quickly. We had a great time in Karlsruhe and look forward to visiting next year for my niece’s 40th birthday and see my two little angels who change too much between visits. Rinse the macaroni briefly to cool, it should still be warm. Dress immediately with the vinaigrette. The warm macaroni absorbs the flavors better than cold. Combine the oil, vinegar, mustard, salt and pepper in a jar. Close and shake. Briefly rinse the macaroni under cold water. It should still be warm. Add to the onion, celery, cucumbers and carrots in a large mixing bowl. Pour the dressing over and toss. Let this absorb for 15 minutes. 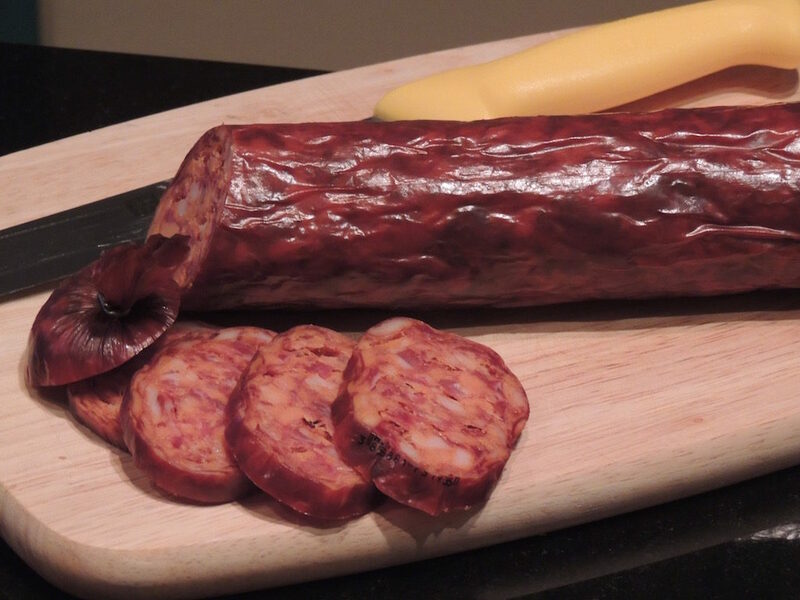 Add mayonnaise and chill for at least two hours. Add more mayonnaise before serving to moisten as needed.